My dad’s ancestors were farmers, not cowboys. Dairy farmers at that. Not exactly yippy-yi-ki-yay kinda animals, those cows. But there are always horses on a dairy farm as well. 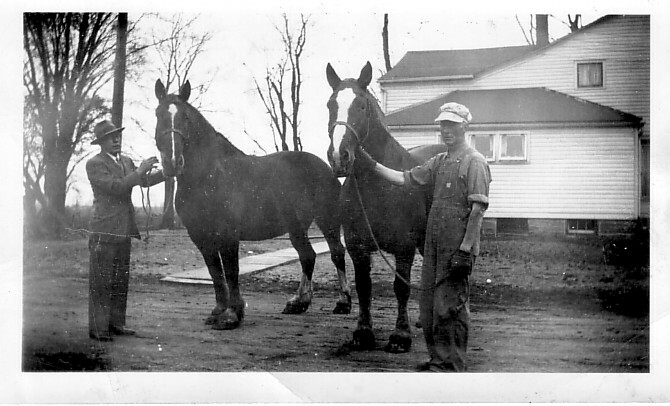 These pictures are of my grandfather Addison Y. Osmer between 1910-1920 with his father’s horses Belle and Queen. When my grandfather Addison had his own farm, he had a team of white Percheron horses, that noble breed whose ancestors were historically used as battle mounts during the Middle Ages. Their names were Topsy and Nellie. 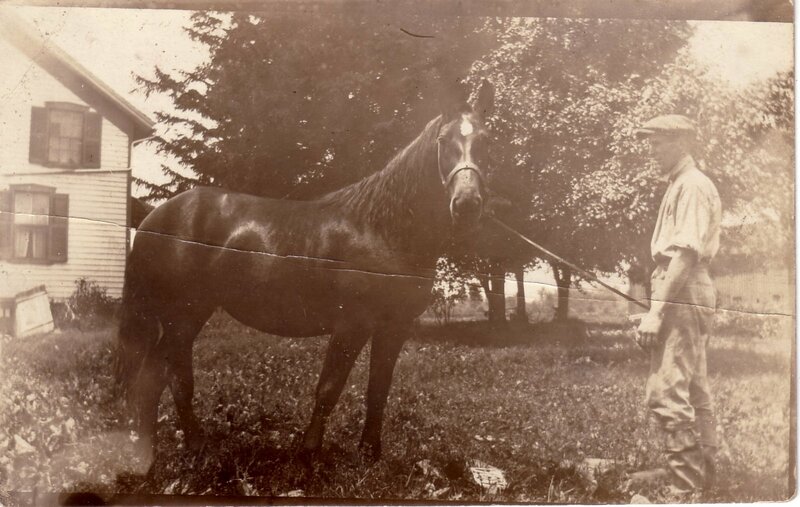 Topsy and Nellie were the all-purpose muscle around the farm – quite literally the horsepower. They pulled any farm implement that needed to be pulled – the walking plow, spike-tooth drag, disk harrow, seed drill, corn planter, grass mower, side rake, dump rake, hay wagon & hay loader, the mud boat (the wet-weather sled), the snow sleigh, and grain binder fo r wheat and for corn. I grew up in Southern California, so I’m not entirely sure what all of those things are, but my dad gave me the information, and they sound like heavy duty farm implements for sure — probably too big to be found decorating the walls at Cracker Barrel. During the depression, grandpa hired out Topsy and Nelly to his nephew who used to build roads for the WPA (Works Progress Administration). They were eventually retired in the late 40s, after the war, when grandpa was able to afford a Farmall tractor. Topsy and Nellie were still part of the farm though, just didn’t have to work as hard any more. In their final years, grandpa would even grind their hay for them to eat because their teeth had worn down to where they could no longer chew hay. We should all be so well taken care of in our old age!